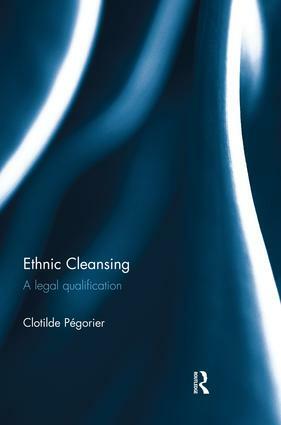 This book confronts the problem of the legal uncertainty surrounding the definition and classification of ethnic cleansing, exploring whether the use of the term ethnic cleansing constitutes a valuable contribution to legal understanding and praxis. The premise underlying this book is that acts of ethnic cleansing are, first and foremost, a criminal issue and must therefore be precisely placed within the context of the international law order. In particular, it addresses the question of the specificity of the act and its relation to existing categories of international crime, exploring the relationship between ethnic cleansing and genocide, but also extending to war crimes and crimes against humanity. The book goes on to show how the current understanding of ethnic cleansing singularly fails to provide an efficient instrument for identification, and argues that the act, in having its own distinctive characteristics, conditions and exigencies, ought to be granted its own classification as a specific independent crime. Ethnic Cleansing: A Legal Qualification, will be of particular interest to students and scholars of International Law and Political Science.